Online piracy is a big deal, but you should know that torrent downloads can be legal 8 Legal Uses for BitTorrent: You'd Be Surprised 8 Legal Uses for BitTorrent: You'd Be Surprised Like HTTP, which your browser uses to communicate with websites, BitTorrent is just a protocol. You could use your browser to download pirated content, just as you could use a BitTorrent client to download pirated... Read More . Yes, this method of P2P file sharing has its good side too! Torrents themselves aren’t to blame. The bad reputation comes from how they’re often used. How does a legal torrent download compare to a direct download? Direct downloads are from a single source, so the speed depends on the download bandwidth available. Torrents speeds are influenced by the number of seeds available as it is a peer-to-peer connection. Here there’s no clear winner because of the variables involved. A direct downloads is like a meeting between two people who “know” each other. A torrent download is a crowd of strangers exchanging bits of data among themselves. With direct downloads, you can lose a big file if your connection stutters. You can pause, stop and resume downloads with torrents — even if unexpectedly interrupted. Some say that torrent files are easier to find. But again, this depends on the kind of file you are searching for. Both types of downloads have their uses. However, if you’re going to download a large file, it may be better to convert it into a legal torrent first. Here’s how you can do that. 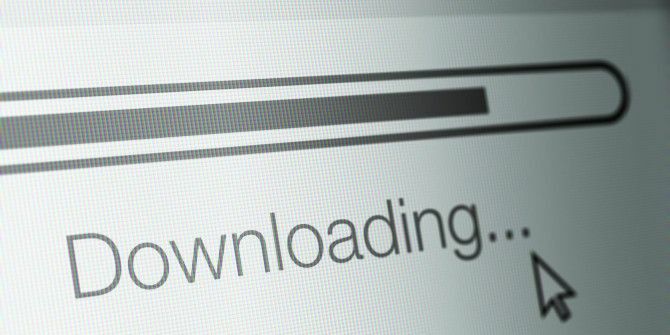 Large downloads eat up bandwidth. One network error and everything is wasted. The magic solution would be a resumeable direct download that you could pause and restart at your whim. URLHash is a web tool that takes a direct download link and converts it into a torrent link. You can then use the generated torrent to download the file with a client like BitTorrent. URLHash saves you the cumbersome job of creating torrents yourself. The utility is an alternative for the popular BurnBit web app, which was shuttered. Take your direct HTTP link and paste it in URLHash. Go past the CAPTCHA and give URLHash some time to generate the torrent link. The processing time will depend on the size of the file and the load of the server where URLHash is hosted. Then, use the torrent link with your favorite torrent client to download the file. From what I can make out, URLHash is the first tracker for the torrent file. In most cases, it might be the only tracker. Your results might vary with the situation and health of the torrent. You will get good results with common but gigabyte sized files like Visual Studio offline installers or Linux distros as the torrents might already exist in the server. Try it out with different files and tell us in the comments if URLHash works for you. Do you know about any other tool that converts direct download links to torrents? As far as I can tell, BurnBit does not work for files hosted on RapidShare, Hotfile, FileSonic, etc. That was mentioned both in the body of an earlier review on MakeUseOf ( //www.makeuseof.com/tag/turn-direct-download-torrent-burnbit/ ) and why it does not is explained clearly in a comment for that review.